Later this month I will be attending my first World Fantasy Convention. I’ve been to many different conventions over the years, but never this one, and never one this big before. WFC is also a bit different. It has not been in the UK for a few years, is typically held in the US or Canada, and several authors attend from overseas who I wouldn’t normally see at a UK SFF convention. This year there are several attending who I’ve admired but never met before, including Scott Lynch and Patrick Rothfuss. The programme of talks and events has not been released yet, but closer to the time I’ll no doubt be sitting down with a schedule and a marker pen, highlighting all the talks I absolutely want to see, the ones I wouldn’t mind seeing, and the ones I will get to if I have time and energy. This three tier system means I’m not disappointed as long as I get to see most of those in the first group, the rest is a bonus. Sometimes it’s not always possible due to scheduling conflicts but I guess we’ll see what happens and also how tired I am. However, even with all of the panels and talks, there will be downtime at a convention like this. There always is, usually the time after the last panel and before the evening entertainment starts. First thing in the morning or just after lunch is sometimes quiet as well. Or there could just be a long stretch where there isn’t a talk I fancy seeing, so I find myself browsing the dealer room endlessly, talking to folk in the bar, or just wandering about aimlessly wasting time until the next thing I want to see. To combat the last, I suggested to a few friends that we spend our downtime doing some tabletop gaming. Due to what will probably be a lack of space, I’ve suggested card games only, stuff that is easy to transport, that doesn’t have lots of tiny markers, is easy to learn and fun to play. I’ve recently been on a bit of Tabletop binge, the gaming show on Geek and Sundry YouTube channel presented by Wil Wheaton. Every week or so he sits down with some friends to play a board or card game and I’ve seen a few I wouldn’t mind playing. 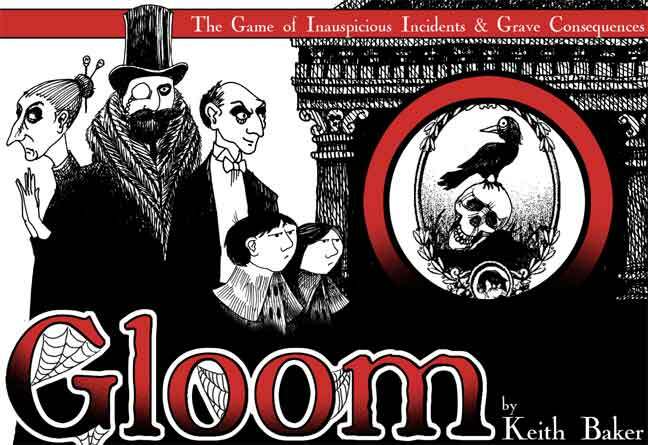 One card game which looked like a lot of fun, and I’ve subsequently purchased, is Gloom. It’s the opposite of Happy Families. You are supposed to drown your Family in misery and you win when all of them die and are very miserable with negative points. You reward other players and their families by bestowing good events on them, earning them positive points. Very dark, a bit morbid and exactly my kind of thing. There is also a storytelling element to the game which is great as everyone I’ll be playing with at WFC are writers. Other people are bringing other games too so I suspect the downtime, and catching up with people on an evening, is going to be more fun than the panels during the day. I’m going to do another WFC related panel closer to the time with something a bit different, but for now, I’m off to learn the rules of Gloom and practice my wicked laugh.